There are five major areas of concern when considering filing for Chapter 13 bankruptcy. 1) The first concern is the type of debt. There are certain debts that can be eliminated in a Chapter 13 at less than 100% payback. There are other debts that cannot be eliminated and must be paid back in full through the plan. Thus, the first consideration that an attorney must look at is the type of debt that a client has. In many cases, most of the debt can be easily compromised. I’m referring to parking tickets, credit cards, medical bills, unsecured loans, utility bills and most debts for services rendered. On the other hand, we do run across cases where the outstanding debt is primarily recent tax debt or outstanding child support debt. In each of those cases, the debts have to be paid back in full since they are not dischargeable. 2) The second concern is the budget analysis. When considering Chapter 13, an attorney must do an extensive budget analysis to figure out whether or not the potential client has the ability to reorganize their debt. There are some cases where the budget just doesn’t make sense. If the person’s expenses exceed their income, then there is simply not a feasible way to make chapter 13 plan payments. A typical Chapter 13 bankruptcy case is going to run anywhere from 3 to 5 years. The amount that the debtor pays per month is based on their income, expenses, assets and debts. 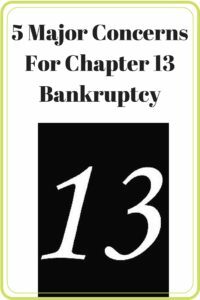 If the debtor does not have a significant surplus from which to pay a portion of the debt over time, then Chapter 13 is not going to be a good option. 3) The third concern is plan feasibility. The attorney has to make sure that the plan being proposed is going to be feasible. By feasible, I am referring to the ability of the debtor to pay that which is required under the bankruptcy code over the life of the plan. In some cases, this could be a simple 10% of the total amount owed over a three-year period. In other cases, this could mean a 100% payback over the maximum 60 months. If the attorney and the debtor cannot propose a plan which is feasible, then it makes sense to not file Chapter 13 in the first place. The debtor should consider either Chapter 7 at that point or non-bankruptcy alternatives. 4) The fourth concern for a Chapter 13 bankruptcy attorney is getting the case confirmed. Confirmation involves more than just proposing a feasible plan. Confirmation involves satisfying the Chapter 13 trustee so that the trustee can recommend to the judge that a plan be confirmed. The trustee is going to initially meet the debtor at the 341 meeting of creditors. After that meeting, the trustee typically has items which need attention. This could be as simple as minor amendments to the documents. Alternatively, it could mean the debtor’s production of certain documentation which can often be difficult on the part of the debtor. Confirmation also pertains to satisfying creditor objections. If the mortgage arrears are not correct, then the lender will file an objection and seek an amendment. If the auto financing company is not happy with the value placed on the vehicle or the interest rate associated therein, there will be an objection from the auto lender. Thus, confirmation issues have a lot more to do with just plan feasibility. A debtor must satisfy not only the trustee’s requests, but negotiate resolutions with specific objection creditors. 5) The fifth concern for an attorney dealing with Chapter 13 is the client follow-through. This means that a client must make a strong effort to make the case work. Making the case work involves timely payments to the Chapter 13 trustee, production of certain documents prior to confirmation, as well as after confirmation and communication with counsel. There are some trustees that are going to require production of pay advises or tax returns subsequent to the case being filed. Some trustees are going to require the turnover of certain tax refunds or tax refunds in excess of a specific amount. The debtor is also going to be responsible for making the Chapter 13 plan payments, whether or not the payments are coming out of the payroll. Thus, the client has a very difficult burden of following through on their case. In summary, there are many Chapter 13 considerations that a debtor and a debtor’s attorney must be involved in. These include the type of debt, budget analysis, plan feasibility, confirmation issues and client follow through. For more information on Chapter 13 bankruptcy and how you may be helped, you may contact my office at 847-520-8100. My group of attorneys and competent staff will assist you in any way possible to try to help you get out of debt through a Chapter 13 reorganization plan.